Barring a miraculous victory in the Pac-12 Tournament, I’m sad to report that the Washington men’s basketball team will not play in this year’s NCAA tournament. That means this season will almost certainly continue a peculiar trend that has seen the Huskies play in both a football bowl game and the NCAA tournament just once since the 1998-99 academic year. Over that 18-year span, UW has made six NCAA tournaments and played in 11 bowl games. Assuming the two were distributed equally, you’d expect three or more likely four years where the Huskies reached both. Yet it’s only happened the once: 2010-11, when Steve Sarkisian led the football team to its first bowl game since 2002-03 and the men’s basketball team lost to North Carolina in the round of 32. 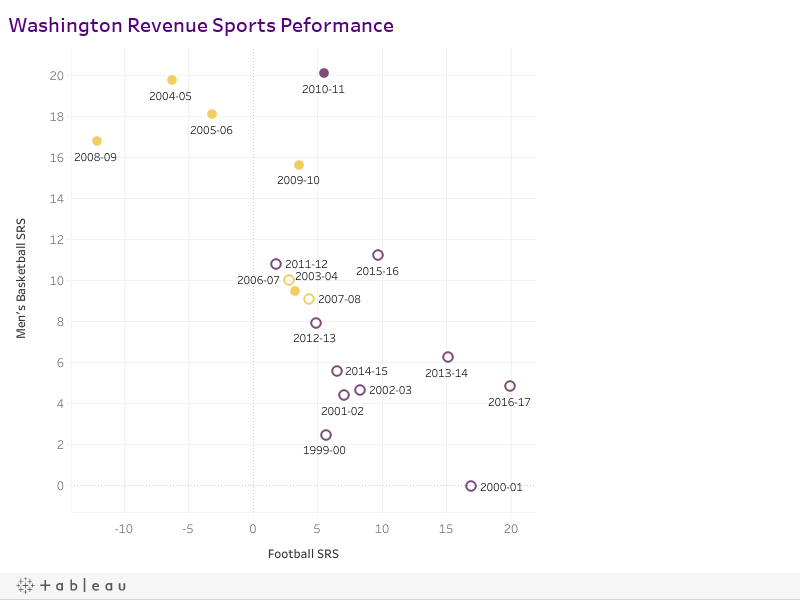 Graphing the performance of the two teams over that span (as measured by Sports-Reference.com’s simple rating system) shows the relationship between Washington’s performance in the two main revenue sports has been closely — and inversely — linked. In fact, the correlation between the football SRS and the men’s basketball SRS is minus-0.7, which suggests about half of the variation in one can be explained by variation in the other. Of the five best seasons for Lorenzo Romar’s teams, four have come when the football team was average or worse. And the three best years for the football team — Sarkisian’s last team, which went 9-4, and conference champions under Rick Neuheisel in 2000 and Chris Petersen this season — have all come when the men’s basketball team was below average. I’m at a loss to explain this trend, which I first observed back in 2011 when it looked like the Huskies were going to buck it for a second consecutive season. Alas, the men’s basketball team was left out of the NCAA tournament despite winning the Pac-12 during the regular season, an unprecedented event that testifies to the power of the football bowl jinx. There’s no logical reason that succeeding in football should hurt the men’s basketball team and vice versa. If anything, their success probably means more resources for the athletic department as a whole. And before my arbitrary cutoff date, there was no relationship whatsoever between SRS for the two sports. So odds are this is nothing but a coincidence that will wash out over time. (Hence the asterisk on the title.) Still, it’s proven a remarkably durable one. This entry was posted in huskyfb, huskymbb. Bookmark the permalink.